While all of Canon's new point-and-shoots look yummy, the shockproof D10 is my absolute favorite: It looks like the streamlined retro-future lovechild of a submarine and an original Bondi blue iMac. Besides being shock, water (up to 33 feet) and freeze-proof (down to 14 degrees F), it's got a 12 megapixel sensor (like most of Canon's new line) and will shoot VGA video (unlike the most of the line, which shoots 720p video). Despite being tough, it actually feels pretty nice in your hand, though it won't fit in your pocket (unless you've got old school JNCOs). If you're not a fan of the blue, it'll have other plates, like orange and camo. I want to love it, so I hope it shoots nice pictures. It'll be $330 when it comes out in May. Consumers looking for an all-around waterproof, freeze proof and shockproof camera should look no further. 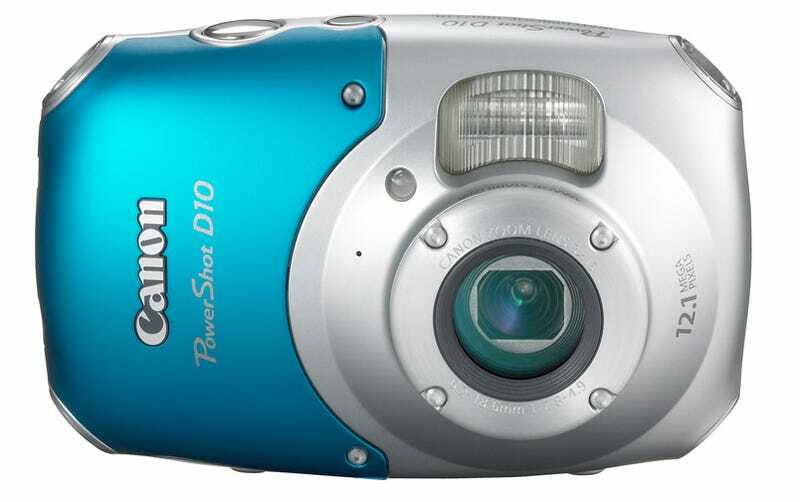 The Canon PowerShot D10 Digital Camera, a first of its kind for Canon, comes equipped with a 12.1-Megapixel resolution and 3x Optically Stabilized Zoom lens, making it an ideal companion for thrill-seekers of all types. This uniquely styled camera is amazing for capturing high-resolution images and off-camera editing. The PowerShot D10 Digital Camera can withstand depths up-to-33-feet deep, is freeze proof from 14 degrees Fahrenheit and shockproof up-to-four feet. To add a little fun and funky style to this great camera, an optional accessory kit is available containing distinctive accessories, such as a customized strap, cool face plates and a carabineer hook (attached to a strap). The PowerShot D10 IS Digital Camera is scheduled to be available in early May for an estimated retail price of $329.99.